Following the brutal torture of West Papuan student Yunus Wanaruni by the Indonesian police, the Asian Human Rights Commission (AHRC) has created an urgent action appeal in calling for justice. The Asian Human Rights Commission (AHRC) has received information from our local partner in Papua about the torture and ill-treatment of a high school student, Yunus Manauri, in Teluk Wondama regency, West Papua province. After Yunus refused to hand over his motorcycle for not having the vehicle’s document as well as a driving license, the police beat him until he fainted. After taking him to the police station, they continued to torture him, and threatened to ‘shoot him dead’ at the shooting range. On 11 October 2017, Yunus Manarui, a senior high school student of grade X, Teluk Wondama Public School 01 (SMUN 01), rode his motorcycle to school. On the way to school, he saw a police officer. He wanted to turn back to his house but finally proceeded go to school. While he was riding his motorcycle, suddenly the police stopped him. When the officers asked about his driving license, Yunus stated that he does not have any driving license. The head unit of police traffic (Kasat Lantas) then asked for the vehicle registration certificates (STNK). When the police asked, “whose motorcycle is this?” Yunus answered that it was his brother’s motorcycle. Then the police pulled out the motorcycle’s key. Yunus asked the police to return the key because his cupboard’s key is inside the motorcycle’s seat. 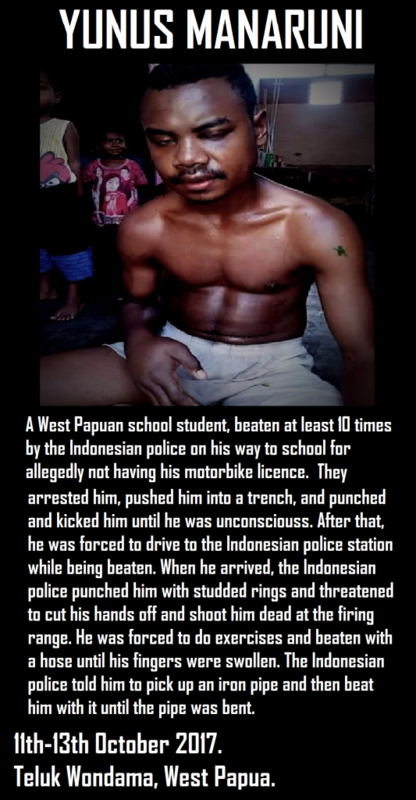 After receiving the key, Yunus immediately started the motorcycle to go to the school, but the police grabbed him and Yunus fell into a trench. After he got up from the trench, Yunus immediately punched one of the police officers. Another officer then pushed Yunus into a new building. Then the officers arrested and surrounded him, and repeatedly punched and kicked him until Yunus fainted. When Yunus woke up, he was brought to the Teluk Wondama Police Office (Polres Teluk Wondama) in Rasiei district. On the way to the police office, the police punched his face repeatedly and took pictures of his face with a mobile phone. At the police station, a police officer who guarded the room and wore stone rings then punched Yunus’ head two times. As a result, Yunus’ head was bruised. Other police officers also threatened Yunus, stating, “bring him to the firing range and shoot him to death’. Yunus was then asked to put his hands on the table, and subsequently one police officer stated that he will cut the hand with a bayonet. Moreover, during police custody, Yunus was also tortured, according to Yunus, the police officers ordered him to pick a broom, where the broom handle made of an iron pipe, then the police hit Yunus’ head with the broom handle, resulting in serious injuries. Another police officer ordered Yunus to sit close to the cell door, then “he kicked my jaw with his shoes. I still have pain in the jaw. There were also officers stabbing my head with a broom handle, moreover I was also tortured hit by a water hose until my hands were swollen, I was also told to push up and jump jack in the cell,” said Yunus. Currently, Yunus feels pain throughout his body, with waist pain, puffy eyes, hearing loss, bleeding lips, nasal swelling and difficulty breathing. Moreover, Yunus has difficulties in sleeping and eating. Then, on October 13, a police officer, Mr. Auparay, brought Yunus back to his home. Yunus’s parents then took him to the emergency unit of the local hospital. Until October 18, Yunus’s condition was very bad; he cannot wake up from the bed, even he is not able to go to the bathroom without help from his siblings. Unfortunately, due to economic reasons, Yunus’ family is not able to bring him to the hospital again, and merely treat him with local medicine made from herbs. On October 19, Wondama Police Officer brought him to a local hospital for further examination, and according to Yunus’ family, Yunus will be brought to Manokwari hospital because his finger bone is cracked. Despite Indonesia having ratified the UN Convention against Torture by enactment of the Law No 5 of 1998, the government failed to develop a high standard of law to prosecute torture, and other cruel, inhuman or degrading treatment or punishment. Therefore most such cases remain unpunished, or merely result in light punishment. In addition, victims and family of torture victims face difficult circumstances due to internal ethic mechanism within the police and the military institutions. So far, the ethic mechanism will be used to prosecute the alleged perpetrators, and only very few cases will be brought to criminal court. For instance, on 1 August 2017 in Oneibo, South Tigi District, Deiyai Regency, Papua, the Police forcibly dispersed and shot the local indigenous Papuans who protested against the Putra Dewa Paniai Company. Up until present the alleged perpetrators have never been brought to the criminal court, on the contrary merely brought to ethic mechanism.